To help you meet and exceed your CPD requirements, we offer an extensive programme of online and face-to-face CPD. Our CPD lectures are delivered in various locations around the country. They cover everything from ethics and regulatory updates, through to technology trends, data protection and technical advancements. User your membership card to swipe in at lectures and we’ll automatically log your CPD hours to your record. Our Spring/Summer 2019 schedule is now available. On the Connect homepage click ‘Events’ under the ‘Catalogue Links’ section. Select your location and register for your chosen event(s). Contact our Events team on 01 645 6666 or events@iii.ie for information on fees and booking. 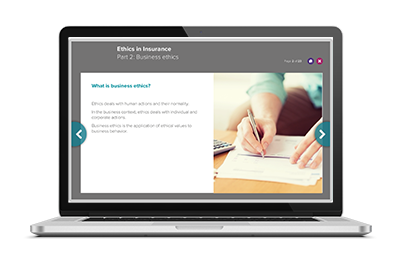 As a member, you have access to an extensive programme of online CPD modules, covering a wide range of topics including ethics. Log into the Member Area and click on the Connect logo. Click ‘E-learning' and then select ‘CPD E-Learning’. You will be linked through to e-learning relevant to your designation. If you have a CPD requirement and are studying toward the Accredited Product Adviser (APA), Certified Insurance Practitioner (CIP) or Management Diploma in Insurance (MDI) qualifications, you'll earn 8 hours CPD for each exam you pass. This is provided you already hold an Insurance Institute designation or have been Grandfathered. Our new member magazine The Insider contains exclusive features, written by industry experts, covering current trends and niche topics within insurance. You can find the latest issue of The Insider in the Member Area. Please note that unstructured CPD is not logged automatically on our CPD Compliance system and you must manually update your record. All of our CPD is built around at least one of the eight distinct Retail Product Categories as specified by the Central Bank’s MCC. Each lecture and e-learning module is assigned the relevant category/qualification so that you can assess if the content is relevant for you. We also accredit content for those who hold DLA, DLDU and DLDC qualifications.